Hawaiian quilting mainly uses two solid colors of fabric, often a brighter color on a light background. An entire piece of cloth is folded in quarters and eighths, cut into a symmetrical pattern based on a plant or flower, appliquéd (stitched on a background), and then contour quilted (quilted following the contours of the pattern). One theory is that the Hawaiians were inspired by scherenschitte, German/Swiss paper cutting. Backside of the same bougainvillea Hawaiian quilt pattern. This shows the contour quilting more clearly and also where I didn't follow the pattern in the center. The back of the quilt has such an intriguing texture. Why did Hawaiian quilting develop this distinct whole cloth style using plant designs? 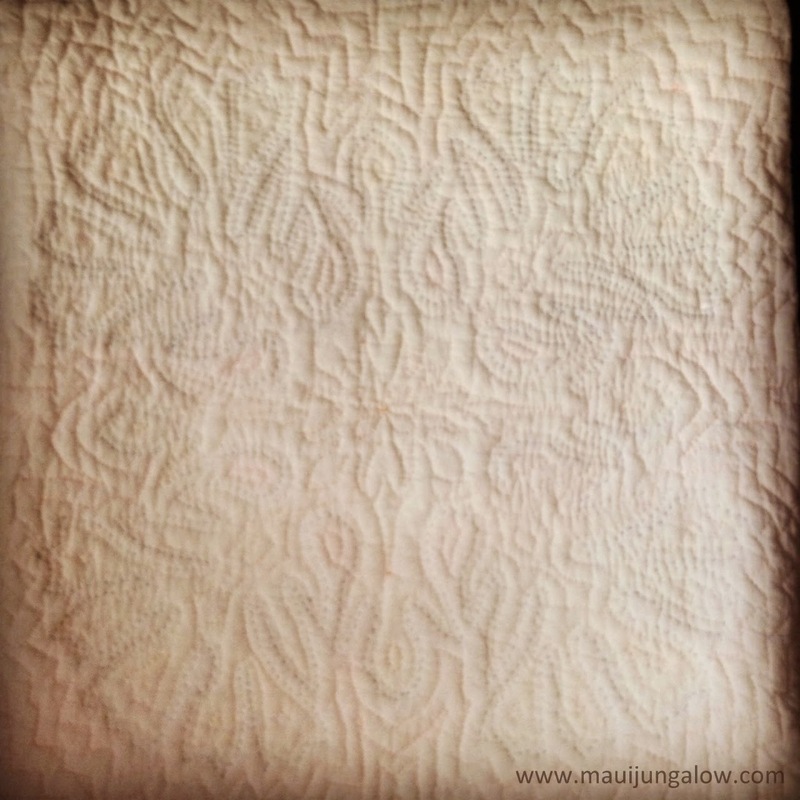 The most interesting thing I discovered is that there were many kapu or rules for Hawaiian quilting, which developed in the 1800s, at a time when Hawaii was changing radically. The kapu system, which was the structure of society, was broken. There were many foreigners in Hawaii. Hawaiian arts like canoe building, weaving lauhala mats, or making koa bowls were being abandoned. Traditional Hawaiian cloth making (kapa or tapa cloth) was becoming rare as the Hawaiians began wearing Western clothes and women wore long dresses called mu'umu'u (to cover up their shocking bare skin). The long garments that Hawaiian women began wearing used much of the cloth with very little scraps of fabric left over, so there were no collections of patches to turn into patchwork quilts. Instead, they started using the entire cloth to cut out a pattern. One theory holds that the single piece of material for the design represented a pure bloodline and purity of spirit. Elements of the quilt design could have different meanings as well. Hawaiian quilting became a way of preserving some of the art and patterns from making tapa cloth. It developed many kapu (or rules) to preserve elements of Hawaiian culture at a time when Hawaiian culture was changing so fast. Hawaiian quilting also became a spiritual practice. No designs of animals because it was believed that the quilt could capture the animal’s spirit and keep it from moving freely. Plants did NOT move so it was acceptable to quilt them. No sharing of quilt patterns. In old Hawaii, each family had their own crest, and the wearing of another’s crest could mean death. Copying someone else’s quilt pattern was similar, like stealing, and could bring shame to the copier and to the original designer. It was also like taking a piece of the spirit of the original maker. Often quilts were hung inside out on a clothesline so the patterns would not show! No showing off the quilt before it was finished. No sitting on the quilt once it’s finished. Nowadays, many of the quilt kapu have relaxed, and sharing of quilt patterns is very common. Contemporary quilters often show quilting in public before it’s finished. Or quilt animal patterns or humans. Or use more than two colors. (I don't know if this was kapu or not.) But there are still traditionalists, who would not dream of doing such things. My quilt teacher was contemporary. Fine-boned and child-sized, she could stitch small, neat stitches. And she was very patient. The first pattern she showed us was the ulu or breadfruit. I remember her saying, if the first pattern you make is the 'ulu (breadfruit) then you will continue to make Hawaiian quilts all your life, because breadfruit is such an abundant tree. I’ve since read that other Hawaiian teachers say to make 'ulu first because it will give you a plentiful life (but you’ll also do more quilting). My quilt teacher next to me, helping with the bougainvillea pattern. The quilt on the far right is the breadfruit pattern. Some of the ladies in my quilt class were amazingly nimble and turned out two or three pillowcases in 6 weeks. I was a bit slower but managed to finish a bougainvillea design, while stabbing my fingers a lot. I did not make a breadfruit for my first pattern, which perhaps is why I have done way more blogging in my life than quilting. Shoots (pidgin for darn). Maybe I should have done my first blog post on 'ulu! 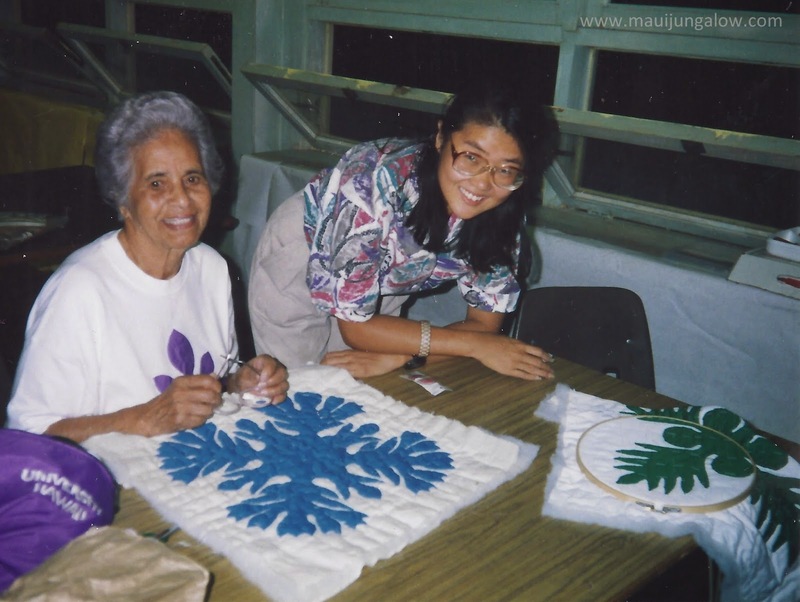 I wish I could tell you my quilt teacher’s name, but in trying to find her name in several books, I found out much more than I had expected about kapu and the spirituality of Hawaiian quilts. I saw my first Hawaiian quilt at a large show. I had to get close to really understand the differences. It was quite impressive. That was years ago but I still am interested so I'm glad our quilt guild is looking for someone who can show us the basic. I have seen many more and each one seems more beautiful than the next. Your photos are wonderful. The quilt kapu is interesting. I'll make sure never to sit on a quilt in Hawaii if the circumstances should happen. I have yet to make a quilt of any kind. The idea of first doing an 'ulu sounds fun. I wonder why we do not eat breadfruit here in the US. It is such an amazing startchy source, and would be a great export for Hawaii, or at least for people living there. It became famous because of the mutiny on the HMAV Bounty, and the Tahitian word uru is pretty close to the Hawaiian word ulu. I love the similarities between all Polynesian languages, and find breadfruit such a versatile, hardy, and amazing plant. I think its image make s beautiful applique on a quilt as well. Have fun with the rest of the A to Z Challenge. I think it's because breadfruit gets soft quickly! in a day or two. It doesn't keep well for retail shelf life! And to transport it! Thanks for stopping by. It's a beautiful quilt pattern too. I've seen some lovely contemporary 'ulu designs as well. I've never had occasion to sit on a big quilt! But I've seen lots of pillow cases! Thanks for stopping by! Hawaii is a place that you have to plan for, because you can't drive there! Aloha Ann, thanks for stopping by! I think there are also some good books and videos on youtube. Though learning with an experienced teacher is special.